Did you know the average toddler takes 14,000 steps per day? That adds up to more than 2.5 miles your little one is walking! These numbers might seem surprising, but walking is just one of the developmental milestones we see in children. We see toddlers taking awkward steps, stumbling, falling, and getting up all the time. Even their name, toddler, refers to the stage when a child practices walking. Now think about all the other skills a child needs to practice as they develop. This could include developing hand and finger strength to write, having the ability to speak and form sentences, being able to describe objects or ask questions, climb and use stairs, listening to sounds, adapting to new tastes and sensations, and much more. Just like walking, children need to practice these skills each and every day. At this age baby loves to be touched, tickled, and cuddled. Take advantage of the time you spend changing baby’s diaper. Try giving baby a quick massage after changing her diaper. Sing a little song to baby as you change her diaper or play some music. Tickle her toes and smile at baby. If you’re sitting to fold laundry or to talk to friends in a living room, let baby lie down near you free of any equipment so she can explore. Baby will kick her feet and look at the world around her. Encourage her to try rolling over, reaching for things, and practicing tummy time. 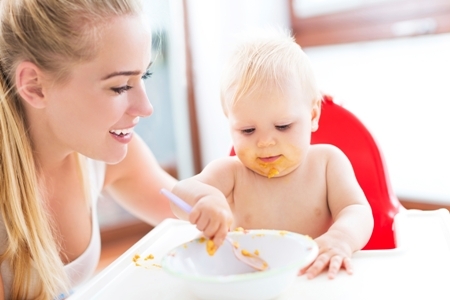 Did you know that when your baby makes a mess while eating it helps them adapt to new sensations? Letting baby get food on their face and hands provides a friendly sensory experience. Your baby is curious about almost everything right now so encourage her to smell foods and touch them. Let foods get all over baby and don’t wipe them off immediately. Encourage different textures and tastes. This is the age when your baby can start to walk around and explore everything in her environment. 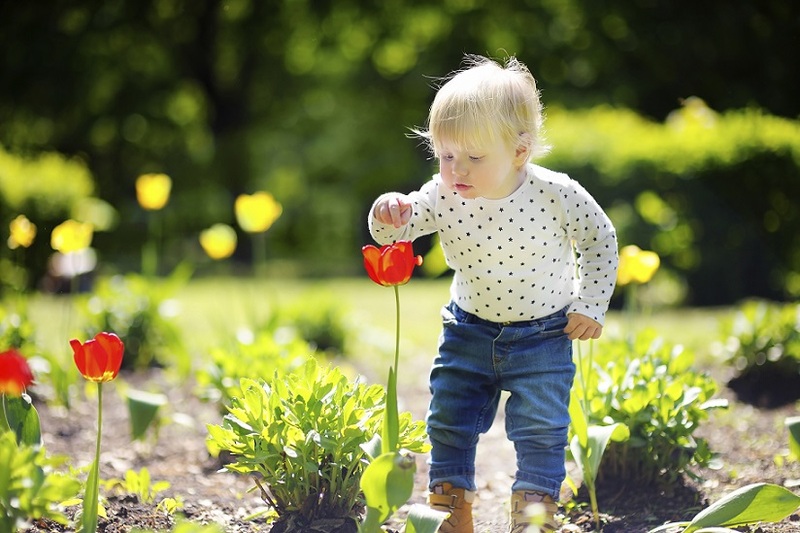 If your taking a walk stop and let baby sniff a flower. If you’re cooking, pause let baby smell herbs and spices at a safe distance from their nose so they don’t inhale anything. Even though they won’t be able to try everything you’re eating, smelling still allows you to introduce new things to baby. Your baby is chirping, chatting, and making so much noise. Let your child stir the mixing bowl when you bake treats. 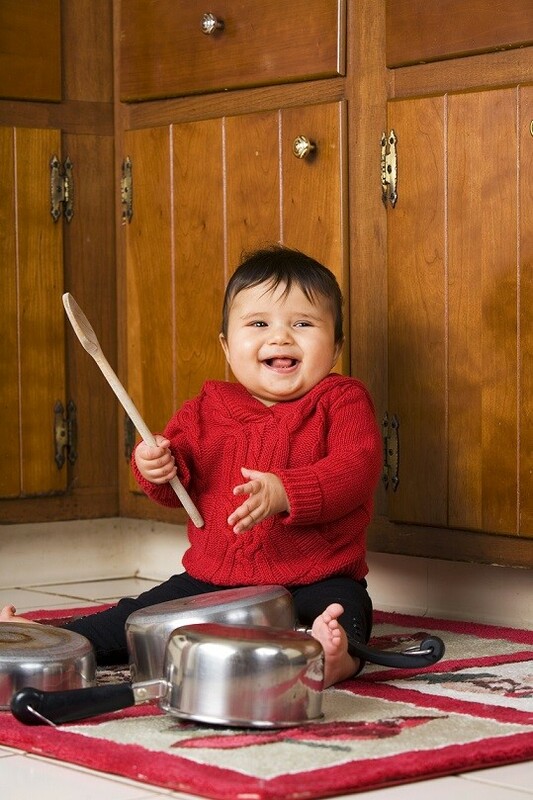 Let your child start their own band. You can also give them clean pots and pans and spoons to play music on while you’re in the kitchen. These are just a few examples of incorporating developmentally friendly activities into your child’s daily routine. To see more enter your baby’s birthday in our baby games and activities calendar. Want more information on babies? It can be tough bringing kids to restaurants. 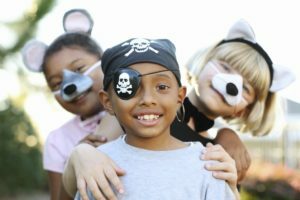 Use these tips to make the experience easier for the whole family. Previous Previous post: What is W-Sitting?